Federico Mussini (left) and Amar Alibegovic both decided to leave Italy because they thought college basketball would be better for their development. Federico Mussini, Nicola Akele, Pierfrancesco Olivia and Giacomo Zilli represent a disturbing trend in Italian basketball – one that is in danger of getting out of control according to one of the leading basketball academies in the country. All four Italian youth national team players have decided to take their talents … okay, sorry … have decided that college basketball in the United States gives them better chances than hoops in their homeland. At least that’s the theory of Giacomo Rossi, the sports director and chief recruiter for the Stellazzurra Basketball Academy Rome. “I am sure that every top (Italian) player will go to the US in the next 10 years if nothing changes,” Rossi said on the Taking The Charge podcast. The hero of Italy’s 2014 Albert Schweitzer Tournament title and Italy’s qualifying for the 2015 FIBA U19 World Championship Mussini turned down a number of offers from Italian clubs and is having a successful season at St. John’s in the United States. Akele, who played at the 2013 U18 European Championship and the 2014 and 2015 U20 European Championships, is going through his freshman season at Rhode Island. The Umana Reyer Venezia product spent the 2014-15 season at the IMG Academy in Florida. Olivia, who played at the 2013 U18 European Championship, was in the Virtus Siena system before going to a New Jersey high school in 2014-15 and is now at St. Joseph’s. And Zilli, a member of the 2015 U20 European Championship team, is in his third season with UNC-Asheville. 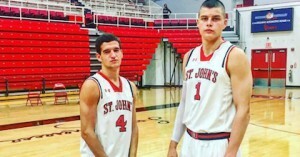 Add to that quartet the Bosnian Amar Alibegovic, who was at the Stellazzurra academy for two seasons from 2012 to 2014 and is now play with Mussini at St. John’s. This is just the start of things, says Rossi. “I think in the next years every top Italian player will go. In Italy when you get to be 18 years old you stop playing because when you get into the (club) senior team nobody gets on the court,” Rossi said. Rossi said he wishes the clubs would act differently. Rossi started the academy at Stellazzurra four years ago and has brought in players from 15 different countries in the last two seasons. And he sees young foreign players who come to Italy much more motivated than their Italian counterparts.